Engineering at CSI focuses on the design, operation, control, and optimization of chemical, physical, and biological processes in systems and processes. CSI's process engineers work with the user to solve existing hygienic process issues or design and optimize new processes. Modern processing facilities are continually pushed to increase productivity and to produce a consistent and safe product—all with less time for maintenance and sanitation. CSI's engineers are available for support to solve process and waste issues, create new systems, and improve existing processes. CSI goes beyond the capabilities of a typical supplier. CSI engineers have intensive experience in field installation and module system fabrication. CSI engineers utilize skids and process modules to reduce the overall site time required for installation, rather than always taking the traditional approach of building everything on-site. 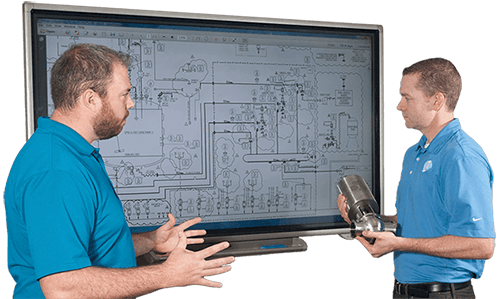 CSI engineers not only look at the equipment and layout, but also the electrical and controls integrations to help determine the quickest, most effective way to execute any project. The food, dairy, beverage, and biopharmaceutical industries are ever-changing in needs and regulations. CSI's staff is heavily involved in industry-critical associations such as ASME-BPE, 3-A, EHEDG, and ISPE. Volunteer work for these organizations keeps CSI employees in constant connection with the emerging needs of customers. CSI's engineers, designers, and equipment experts specialize in hygienic process systems and equipment. CSI's experienced engineering team is ready to help with a variety of problems: a piece of equipment that won't clean properly, a system that isn't operating to its potential, or a project that needs the review of a sanitary process expert. An engineering study performed by one of CSI's hygienic process experts can diagnose complex issues and develop advanced solutions. This is especially true in cases where the requirements for equipment and processes have changed. It's not unusual for many gradual, slight changes to lead to equipment failure or sanitation concerns. These issues often cannot be solved by changes in maintenance or sanitation procedures. CSI can send a process engineer to a site to diagnose the cause of the problem and develop a resolution action plan. An engineering study performed by one of CSI's hygienic process experts can diagnose complex issues and develop advanced solutions. CSI's team of process engineers, project managers, and designers work with users throughout the entire process to ensure each project is properly designed, inspected, and documented. Every skid-mounted process system will ship on time, on budget, pre-tested, and ready for utility hookup to avoid costly downtime. CSI's process engineers and technical support work with your staff to provide solutions in a variety of areas. Our engineers are up for whatever challenge you can bring them. CSI's team of experts is standing by to answer any question. Browse the employee directory to find the right person.